On Saturday, November 25, 2017 The Hip Hop Architecture Camp was featured on The TODAY Show. The Today Show segment was filmed during a camp in Los Angeles hosted by The La Kretz Innovation Campus. 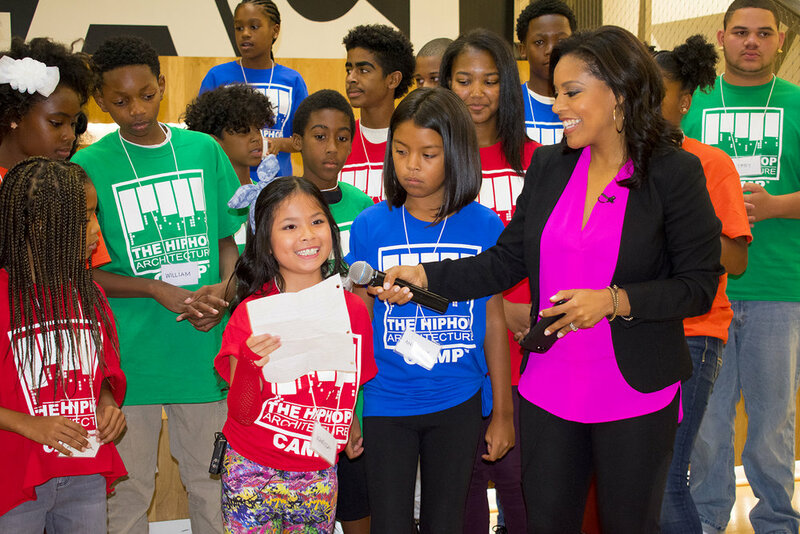 Our camp participants were joined by Sheinelle Jones co-anchor of NBC News' “Weekend TODAY” and a mid-week correspondent for TODAY. Click the video below to view the entire segment and visit The Hip Hop Architecture website for to see the Hip Hop Architecture Camp Visual Album and Mixtape created by participants in variousc cities and to find out how to bring the camp to your city. The Hip Hop Architecture Camp is a national initiative created by Michael Ford, The Hip Hop Architect, which uses Hip Hop Culture as a catalyst to introduce underrepresented youth to architecture, economic development and urban planning. The Hip Hop Architecture Camp is nationally sponsored by Autodesk and The Urban Arts Collective and made possible by local volunteers and local sponsors. The National Organization of Minority Architects (NOMA) announced its talented and diverse group of 2015 NOMA Magazine Volunteer Staff, a group I am honored to be a part of. Our editor in chief is Devanne Pena I'm excited to work with her as she brings new energy and direction to the bi-annual publication. I've blogged on several occasions about Ice Cube receiving a degree in architectural drafting prior to NWA's success. He has continued to show his love and affection for the profession in a variety of ways, including his involvement Getty, as they released a celebration of Charles and Ray Eames. Below is the recreation of the Classic Eames shot in the extremely rare DAT-1 chair created by Eames in 1953. See my previous post "Ice Cube Celebrates the Eames" for a video tour of South Central LA and Ice Cube's reflection on Eames in a style that only Cube can pull off! "Walk at Your Own Risk" published in Architect Magazine, is very interesting to me, because I constantly speak about architects and planners developing more than the simple physical environments people attribute to our profession. As a whole, we unintentionally shape the subconsciousness and cultural incubators of the inhibitors of our spaces. I challenge all designers, planners, architects etc to make conscious strides towards considering the social implications of their architectural designs and plans on the intended users. This commercial aired a few years ago, but with Kevin Durant quickly becoming one of the best scorers and developing an impeccable brand and The Mo Williams Academy becoming a basketball development brand to be reckoned with, I think the commercial needs to be revisited for a those reasons, plus the cross disciplinary effort which went into making it a success. DJ Quick was the composer and producer overall for the commercial and the beats, the NBA players created the lyrics and the commercial was directed by Andreas Nilsson.